"If I get violent, it's because I love you." Jean Renoir is vast, he contains multitudes. In addition to all his celebrated accomplishments as the old master of French cinema, a look at this DVD suggests that he's the grandfather of film noir, too. This is pretty pulpy, almost sensational stuff for a filmmaker of Renoir's elevated reputation; and it comes with a literary pedigree as well, as it's based on a novel by Emile Zola. It's a movie about the bad thoughts that can hide behind a pretty face, and, as much as anything else, it's a true love story about a man and his train. 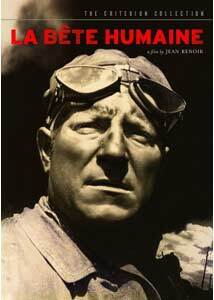 Jean Gabin is the very personification of French film history, and he's front and center here, as Lantier, an engineer on the line between Paris and Le Havre. The movie's visceral opening sequence shows Lantier and his partner, the womanizing Pecqueux, laboring intensely to make this gargantuan, smoke-belching piece of machinery glide smoothly along, the dirty hard work that undergirded the effortless elegance of train travel, if you could afford a first-class ticket. They reach their destination safely, but mechanical problems keep the engineers waylaid in Le Havre for longer than they'd care to stay. Soon thereafter we meet the slinky Severine (Simone Simon) and her older husband, Roubaud (Fernand Ledoux), who seems to know that wearing the cuckold's horns is his fate�he just hadn't expected that the other party in the affair would have been his wife's godfather, Grandmorin. Crazed with rage, Roubaud vows to exact his vengeance, and he does so by luring an unsuspecting Grandmorin onto a locomotive�Severine is his partner in crime, and all goes according to plan until, just as Roubaud is finishing the deed, Severine encounters Lantier, her stranger on a train. When Grandmorin's corpse spills out of his cabin and Lantier swears he didn't see a thing, his unholy bond to Severine is firmly established. What follows are all sorts of permutations on infidelity, as Lantier gets ensnared in Severine's web as he wrestles with his own conscience�it's not the stuff we think of when the director comes to mind, so if you need to preserve your elevated sense of Renoir's aesthetic based exclusively on great films like Grand Illusion, stay away, because this one will puncture those notions. It's also at times almost more about the social fabric of French society on the eve of the Second World War; the anxiety is palpable, and it's almost as if you can feel the storm clouds brewing. Renoir was unrivaled as a social critic among film directors; you can trace some of Robert Altman's best work back to a film like this. And technically, the filmmaking is little short of breathtaking. Renoir's sense of composition is exquisite, and his modulation of gray levels must have been the envy of still photographers of the period. But he never gets woozy with technique, and the story chugs along like, well, a train rumbling down the tracks, a stern morality tale of sorts that relishes its soapiness. It won't make you rethink the whole Renoir canon, and won't replace The Rules of the Game at the top of the pyramid, but is probably more of a crowd pleaser than the Renoir we've come to know. Image Transfer Review: The transfer is a crisp and strong one, though there seem to be frequent problems with the source material. A handful of frames seem to be missing, giving some of the scenes and unpleasant staccato quality, and every now and again you can make out imperfections that even Criterion's capable technicians could not eradicate. Audio Transfer Review: Limited dynamics, as you might expect with a film of this vintage, but it sounds fine on this mono track. Extras Review: Decades after making the film, Renoir filmed an introduction (06m:18s) which you probably shouldn't watch until after seeing the feature, for it's full of plot spoilers. He's very much the grand old man of French cinema here, and reports, without embellishment, that he cranked out the script for this movie in twelve days. In a 2004 interview (11m:21s), Peter Bogdanovich situates this in the context of the French films of the time, and discusses its place in Renoir's career. A 1968 French television show (24m:00s), Adapter Zola, is all about the suitability of the novelist to the screen; Renoir is among those interviewed, and this film is discussed extensively by Zola scholars and screenwriters, as is Fritz Lang's Human Desire, also based on a Zola novel. Best of all, though, is a clip (07m:00s) from 1957, Renoir reunited with Simon�the director and leading lady set about to re-create her work in a climactic scene in the film, and even if the environment is highly artificial (with a studio audience and twenty years after the fact), it's an extraordinary opportunity to get a glimpse of Renoir working, wheedling and cajoling, flattering and disciplining, setting about to get just what it is that he wants and needs for his movie. Also on the disc are an original trailer, and a gallery of stills from the set and posters from around the world. The accompanying booklet merits perusing, as well�it features an essay on the film by Geoffrey O'Brien, a 1991 Sight and Sound article by Ginette Vincendeau, and reminiscences on the shoot from production designer Eug�ne Louri�. There's no pretense here, and Renoir has made a movie that's steamy in at least a couple of ways. Gabin is in fine fettle, and if Simone Simon batted her eyes at you, you'd fall in line, too�a welcome addition to the Criterion Collection.